This year, the city will witness its one and only indoor jazz festival with 10 days of incredible programming. 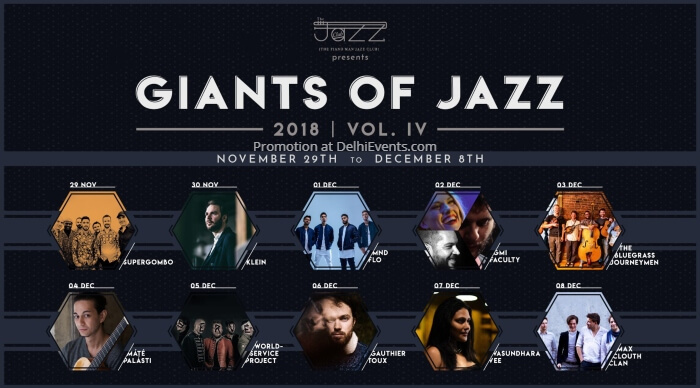 Giants of Jazz is the only festival to offer unique live acts through every single day of its 10-day calendar. Supergombo from France will be opening the festival on Thursday, 29th November 2018. The Afro-funk band will bring fresh guitar solos, groovy basslines and melodic beats to the stage. Followed by Klein, who will take you through genres, from jazz to pop, rock, to free improvisation, MND FLO and a power-packed finale with Max Clouth Clan, there will be a never-before-seen range of artists to appreciate on just one stage. GoJ 2018 also sees the return of the amazing act The Bluegrass Journeymen – a collective that is guaranteed to bring the house down again! All this and more, only at the city’s very own hub of music, artistry and culture, The Piano Man Jazz Club.